Great news George is home 🐾❤️🐾 Too Hot To Handle. You helped by sharing. Thank you. 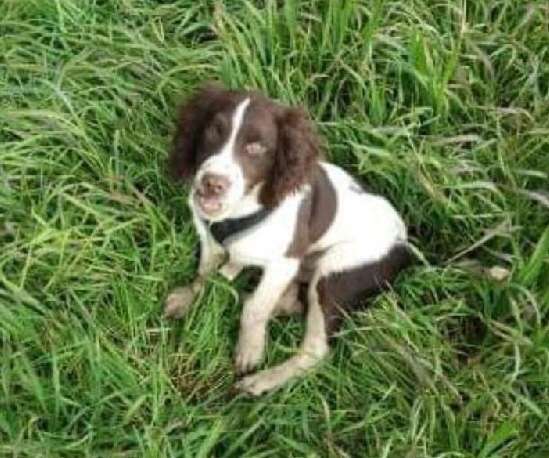 George, a four-month-old Springer Spaniel, was snatched from the back of a vehicle in Warrington Road, Abram, Wigan, on Sunday morning (14th April, 2019), close to the former Dover Lock pub. When they returned to the vehicle just a few minutes later, however, they discovered that the beloved puppy was gone. The latches which open the back of the 4×4 had been unlocked, and someone had snatched George. George was wearing a black harness when he went missing, and is micro chipped. If found, he must be reported to the council’s dog warden, as required by law. DogLost on 0844 800 3220. ← Stolen pug reunited after CCTV of thieves released. #PetTheftReform.